According to Econsultancy.com Comparison Shopping Engines Survey, retailers spend approximatively 11% of their online marketing budget on shopbots while agencies say that on average their clients spend 14% of online budget on this channel respectively representing 10% and 16% of online sales. The average Comparison Search Engine user is a savvy and trusting buyer looking for complex products sold by either retailers or manufacturer. 1/ Place your products in front of browsing consumers during the exploratory phase, just before purchasing becomes intentional. 3/ Ensure consumers see your products on every available channel including Search Engines (SEM or SEO) or marketplaces (eBay, Amazon). Who are the Comparison sites users? According to a study from Forrester Research, they are savvy, trusting buyers. Search engines and Comparison Search Engines (CSE) users differ from the average consumer in behavior, spending more time online, sending and receiving more emails. These consumers trust their sources – both peer-generated content and commercial messages – more and are less price-sensitive. They research complex products. Hardly any consumer used search engines or CSE as information sources for simple products like cosmetics – they just go to the store for those. The heavy traffic on these sites comes from consumers researching complex products like mobile phones, audio equipment, etc. 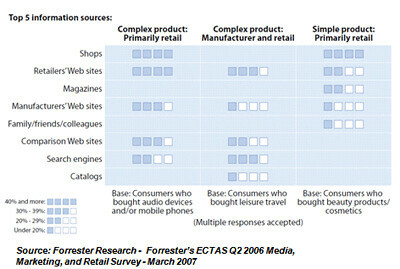 Adding up the info sources, it is clear that consumers use multiple sources to research complex products. Which Comparison Engines to consider? According to a study published in May 2009 by the CPC Strategy LLC among Internet Retailer’s Top 500, Google Product Search leads in market penetration with 72.2%. Shopping.com and Pricegrabber follow with rates of 53.8% and 50.6% respectively with Microsoft’s snagging 30.2% of the top 500 market. 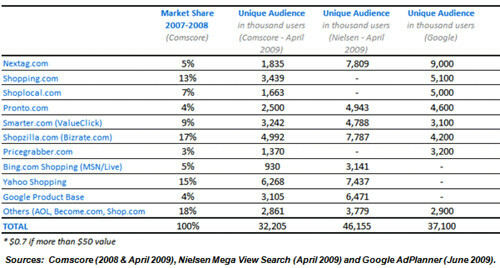 Top 10 ranking per audience - 25% of the US internet audience (nearly 50 millions) is passing through a shopping engine. 75% of the traffic goes to the top 7 shopbots. b) Product Ads: merchants list products on Amazon and drive consumers back to their sites as opposed to having to buy through Amazon (CPC: $0.7 – daily budget). 2/ Bing Shopping – allowing advertisers to sell on a cost-per-acquisition (CPA) basis and Cashback offers. Direct customers are rewarded by having a % amount of cash on every transaction & Microsoft is also keeping a fee on these sale. See example below with AT&T (35%), eBay/Paypal (8%), TigerDirect (7.3%), HP (3%), etc. Microsoft's Cashback Program through their Bing search engine allowing new AT&T's customer to get 35% off the iphone 3GS in June 2009. Nick, agreed. Thanks for sharing these links! Regarding the new generation CSEs, I would go for Retrevo.com (2.6 Million Unique Visitors/month – alliance w/ PriceGrabber) offering Social Media features & community evaluation for quality/pricing ratio. I would also mention PriceSpider.com providing Social Shopping services, price history graphs, personalized price alerts and a unique section of coupon/deal finders that you generally find on affiliate partners (supported by Digital River since 2009). The problem for these new entrants is to reach a critical mass (i.e. minimum of 4 Million Unique Visitors/month) by making a partnership with an existing competitor, a leading portal or a Search Engine.